Takata Corp. is in the midst of recalling approximately twelve million automobiles worldwide for faulty airbags. The Japanese manufacturer’s airbags have been linked to injuries and deaths that resulted from a number of bag defects, including a faulty inflator that can explode too forcefully and project shrapnel at high speeds toward drivers and their passengers. Eight million of the recalls are in the United States, including automobiles manufactured by Honda, Toyota, and General Motors among others. General Motors and Toyota have gone as far as warning owners of recalled models to ban passengers from the front seat, where they are closest to the possibly defective Takata bags. Toyota is telling dealers who do not have replacement parts to disable the passenger-side front bag and put a warning label on the dashboard. Nissan announced Saturday that it is recalling more than 52, 000 vehicles with Takata airbags. The newly recalled vehicles were sold or registered in twelve high-humidity states and territories as humidity can cause the airbag propellant to burn too fast and potentially blow apart the metal canisters. Affected states and territories include Alabama, Florida, Georgia, Hawaii, Louisiana, Mississippi, and Texas as well as the territories of Puerto Rico, the U.S. Virgin Islands, Saipan, Guam and American Samoa. Honda too is adding hundreds of thousands of vehicles in those same states to an earlier announced recall, including older versions of the company’s three most popular models: the Accord, Civic, and CR-V. 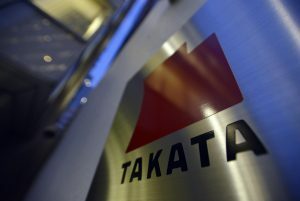 The company had already recalled approximately five million vehicles in the United States for issues with Takata airbags.